Ladies and gentlemen, welcome to the Lockheed Martin/Kennedy Space Center launchpad, brought to you by WeatherTech in conjunction with Under Armour. I'm Buzz Lightyear, an animatron brought to you by Disney/Pixar. We're here today to celebrate the launch of the all new Bud Light/ScotTissue rocket which will send our astronauts sponsored by Doritos Space Blast - a flavor that's out of this world - zooming into space in their Tommy Hilfiger uniforms and their new night vision/3d capable/5G GoPro helmets from Ralph Lauren Space. We'll be tracking everything on our Quicken Loans launch metrics dashboard tracker; you can download that app, as well as the Kushner Companies astronaut voice tracker app, in the Apple Store and Google Play. Joining me now on the Boeing anchor desk designed by our friends at EA Sports are former astronaut and true American hero John Glenn, appearing holographically thanks to VNTANA from Arlington National Cemetery, and Jim Bridenstine, our NASA/Linked in Administrator. 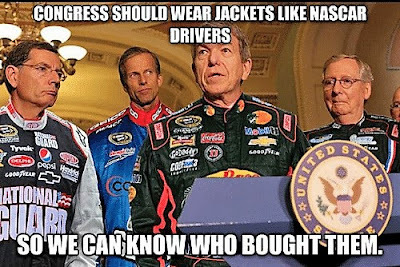 Yep, that's right: Bridenstine is thinking we need a little more NASCAR in our NASA. The constant creep of corporate America into all aspects of everyday life - from the Allstate Sugar Bowl to Minute Maid Park - may soon conquer a new frontier. Is it possible for NASA to offset some of its costs by selling the naming rights to its spacecraft, or the naming rights to its rockets? I'm telling you there is interest in that right now. The question is: Is it possible? The answer is I don't know, but we want somebody to give us advice on whether it is. I'd like to see kids growing up, instead of maybe wanting to be like a professional sports star, I'd like to see them grow up wanting to be a NASA astronaut or a NASA scientist. I'd like to see, maybe one day, NASA astronauts on the cover of a cereal box, embedded into the American culture. Some of this, certainly, comes from the Trump Administration's pro-corporation/pro-privatization fetish, as we've seen with expanding corporate access to federal lands, and efforts to privatize the VA and other programs, including potentially ending direct funding for the International Space Station, something Congress is not happy about - so much so that senators Ted Cruz (R-Texas) and former astronaut Bill Nelson (D-FL) were in complete agreement on the issue. In 1993, a Georgia company called Space Marketing proposed putting a billboard in space so big that it would be visible from Earth. But the plan was met with disapproval form some in Congress, who derided the idea, saying space was a commons that should stay free of advertising. Edward J. Markey, then a Massachusetts congressman, lamented the possibility of children wishing "upon a falling billboard." "Every sunrise and sunset would beam down the logo of Coke or GM or the Marlboro Man," he said. That would turn our morning and evening skies, often a source of inspiration and comfort, into the moral equivalent of the side of a bus." Yeah, but can't you see it?? A Heinz ketchup commercial, with 'Anticipation' in the background, as we wait for the sweet red blob to fall from space and land, a perfect 10, on a 100% all-American hamburger somewhere in the heartland? Talk about #MAGA! Of course, there's always a chance that Congress will change their collective mind - especially if we let our elected officials show their own brand loyalty.